Source: CICH graphic created using data adapted from Towards a Healthier Canada – Health Inequalities Data Table, Health Inequalities Data Tool, A joint initiative of the Public Health Agency of Canada, the Pan-Canadian Public Health Network, Statistics Canada and the Canadian Institute of Health Information. 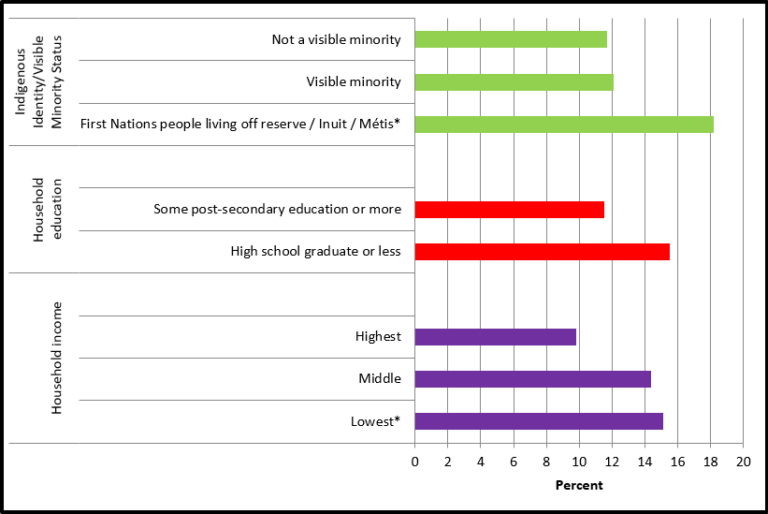 Data from the Canadian Health Measures Survey (CHMS; 2009-2013). Children adversely affected by the social determinants of health are at higher risk of having obesity. Children and youth who live in the lowest income families are more likely to be obese than are those who live in the highest income families – 15% versus 10% respectively. Children who live in households with lower levels of education are more likely to be obese than those with higher levels of education. In 2009-2013, 16% of Canadian children and youth aged 6 to 17 years who lived in households where the household education level was high school or less were obese compared with 12% of children in households where the household education level was some post-secondary education. 18% of First Nations children and youth aged 6 to 17 years were obese in 2009-2017 compared with 12% of children who were visible minority and 12% of children who were not a visible minority. 1Lima RPA, Hayashi DN, Lima KQDF, Gomes NIG, Ribeiro MR, et al. (2017) The Role of Epigenetics in the Etiology of Obesity: A Review. J Clin Epigenet. 3:41. 3Heerman, W. J., Krishnaswami, S., Barkin, S. L., & McPheeters, M. (2016). Adverse family experiences during childhood and adolescent obesity. Obesity, 24(3), 696-702.